A refrigerator or cold room door seal is a form seal for refrigerators, refrigerated vitrines or refrigerated cabinets. The refrigerator profiles are available in many different shapes and qualities, both with magnetic gasket and without magnetic gasket. Refrigerator seals must be made of food-grade material. The fridge door rubber profile is usually gray or white. The refrigeration or cold room rubber profile is fixed by screwing or sliding into a guide rail on the frame or on the refrigerator door. The seals are mostly made of a food-safe EPDM material. The gaskets are often white or gray. 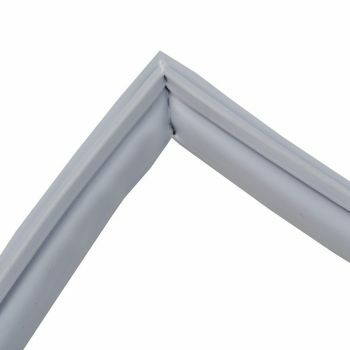 The refrigerator profiles are temperature resistant, as a rule the gasket is quite smooth on the outside, so that the dirt can not be so easily attached. The offered cold room or fridge rubber seals reduce the formation of mold and the spreading of bacteria in the refrigerator seal. Hygiene is our top priority when it comes to food. In the worst case, food poisoning can cost people's lives. Therefore, clean your refrigerator rubber profiles immediately if the door seal is dirty. We have a huge range of fridge freezer, fridge and freezer door seals & gaskets. If you are unsure of the seal required you can contact us and send a photo of it and we will help you at your choice. Refrigeration gaskets are tight fitting, which inhibit infiltration of warm, moist air into the cold refrigerated space, which provides a dire..